Powderham Church is dedicated to Saint Clement, one of the first Bishops of Rome. His feast is kept on 23rd November in the Anglican Communion, and he is patron saint of metalworkers and blacksmiths. 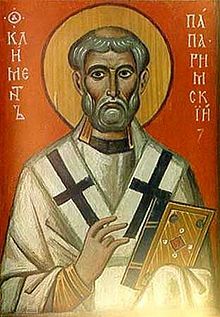 Theologically, Saint Clement is best known for his Epistle to the Corinthians, an insight into the early Church’s ministry (certain bishops have been deposed, and Clement calls for their re-instatement and the repentance of the congregation). The full text of Saint Clement’s Epistle is here, and you can read much scholarly information about Saint Clement here. Wikipedia has an interesting article about Saint Clement, from which we have taken the paragraphs below about his martyrdom and symbology.